Aniosoft iPad iPhone iPod Photo Transfer is a sound of blessing for frustrated Apple's iTunes users who can't transfer photos from iPod to pc since iTunes blocks iPod to computer photo transfer. Aiseesoft iPod to Mac Transfer is designed for Mac users to backup the files on your iPod/iPhone/iPad to the Mac local disk. This iPod to Mac Transfer can copy your selected music, movies, camera roll, and picture to Mac immediately without any loss. Aiseesoft iPod to Mac Transfer Ultimate is designed for Mac users to copy your selected music, movie, TV show, podcast, iTunes U, ePub, PDF, audio book, camera roll, picture, voice memos and camera shot files to your Mac immediately without any loss. Joboshare iPhone Photo Transfer can fast transfer iPhone Photo, Camera Roll (iOS 4 above) from iPhone to Computer with ease. Moreover, it can also transfer music, video, Podcast, TV Show from all types of iPhone/iPod/iPad to Computer. Tansee ipod Transfer Photo is the easiest-to-use and fastest photo to computer transfer software for Apple iPod on the market. It can transfer all photo to computer. And can backup photo in different size and type. . .
AnyMP4 iPod to PC Transfer Ultimate is the professional software to transfer all iPod files to computer for backup. With it, users can conveniently copy music, movies, TV shows, podcast, iTunes U, ringtone, ePub, PDF, etc from iPod to PC. AnyMP4 iPod to Mac Transfer is professional software to your iPod device. It can help iPod users transfer music, movies, ringtone, camera roll, picture, voice memos, camera shot, etc. AnyMP4 iPod to PC Transfer is a professional transferring software, which can transfer all iPod files to computer for backup. With it, users can conveniently copy music, movies, ringtone, camera roll, voice memos, picture, etc from iPad to PC. 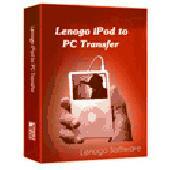 Lenogo iPod to PC Transfer is a sound of blessing for frustrated Apple's iTune users who can't copy music files from iPod to pc desktop or laptop since iTune blocks iPod-to-computer song transfer. Daniusoft iPod Music Transfer is totally free and easy to use application for transferring music/ Video between ipod and computer. Tipard iPod to PC Transfer Ultimate can help you copy music/movie/TV Shows/Podcast/iTunes U/eBooks/Pictures/Voice memos/Camera shot from iPod to PC without losing anything. Also, the Backup Function can help you easily backup all SMS, Contacts.